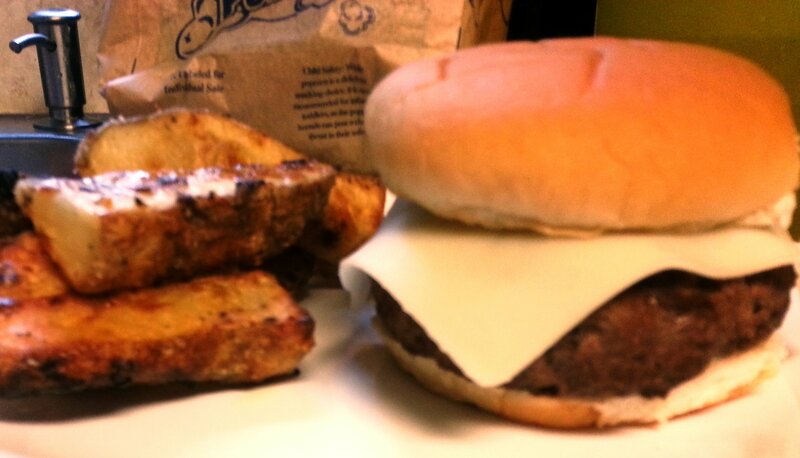 When I was out at the store today, I decided that I really wanted hamburgers for dinner. 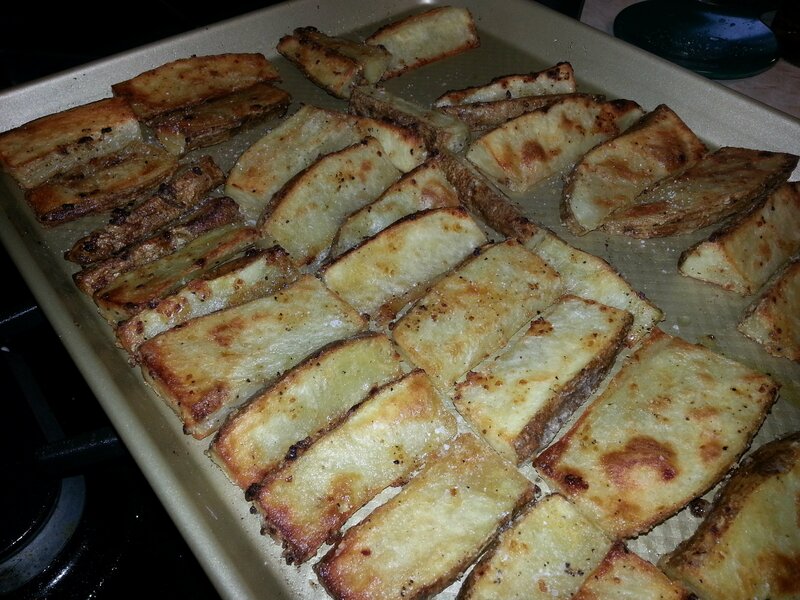 I also stumbled upon an interesting recipe for oven baked fries which inspired the ones I made tonight. Bingo – we have a dinner plan!I don’t buy hamburger patties anymore. I always make my own. They are super easy to make. Plus the beef is less expensive if you form them yourself. I just take one-third of a pound of ground beef per person and season it with salt, pepper, garlic powder and onion powder or dried minced onion. I like the dried minced onion because it soaks up the juices from the meat and makes an awesome burger. Mix the spices into the meat and form it into a patty. with your thumb, make a little divot in the middle of the hamburger. This keeps the middle of the burger from getting thicker when it cooks so you don’t get that weird bump. Works like a charm. Grill or cook in a skillet until desired doneness. I have a meat thermometer to measure the temperature so that my husband gets his burger rare and mine is medium. Insert the thermometer in the side of the hamburger to check for doneness. I just pick my burger up with some tongs which makes checking the temperature so much easier. Oven fries are usually tough. Typically they come out undercooked or soggy. These ones came out wonderful. The secret is cornstarch! They were wonderfully crispy. My sister-in-law and husband thought they were awesome. These will go into regular rotation. Did I mention they are garlic flavored? Oh yeah, they are! Heat your oven to 450 degrees. Mix the oil and garlic in a large microwave safe bowl (Pyrex works well for this). I smashed everything together a bit with a fork to get everything well infused. Microwave the oil and garlic on high for 20 to 30 seconds. This helps speed up the infusing process. Remove 4 to 5 tablespoons of the oil (leave the garlic in the bowl) and spread the oil on a sheet pan*. Wash and dry the potatoes. Do not peel them! Cut the potatoes into wedges. The potatoes I used were huge so I had to cut them into wedges and then cut the wedges in half which is why my fries look a little odd. Add the potatoes to the garlic and remaining oil and toss to coat. Cover the bowl with a lid or plastic wrap and microwave for 3 minutes. Stir everything up again and microwave for another 2 to 3 minutes or until the potatoes start to look translucent. My gigantic potatoes took 6 minutes total. If you cut them into smaller pieces, they will take less time. While the potatoes are in the microwave, mix together cornstarch, salt, pepper, onion powder, garlic powder and cayenne. Once the potatoes are finished, sprinkle the cornstarch over the potatoes and mix everything together. I let them cool for a few minutes and mixed with my hands. It gets kinda messy but the tongs just were not doing the job. Lay the potatoes out on the sheet pan. Keep them in a single layer and try to keep them from touching. I had some stick together because it was hard to hit them all on one pan. Again, HUGE potatoes! Bake for 20 minutes then turn the potatoes over and increase the oven temperature to 475 degrees and cook for another 10 to 20 minutes. The reason for the temperature increase is to help improve browning without drying out the inside of the potatoes too much. I think 450 for the entire time and the potatoes would not have been as done as I would have wanted. I also think 475 for the entire time would have dried them out too much. This technique worked really well. Once the fries come out of oven, you may want to sprinkle them with a bit more salt. I can cross another item off the list of recipes that have eluded me until now. These potatoes are a keeper. *I love the Williams-Sonoma goldtouch sheet pans. I have replaced almost all of my bakeware with this line. Nothing sticks to them and they are so easy to clean. They are a bit more expensive than other pans but they last forever. They are well worth the investment.